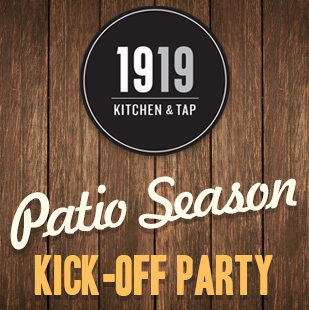 Head down to 1919 Kitchen & Tap for a day of fun as we kick-off patio season with an all-day party! WIXX will be on-site with a Live Broadcast from the 1919 Kitchen & Tap patio from 12pm-2pm. Be sure to get there early, though, so you can claim your spot in line for the last "Dells Drop" of the season! For more information regarding that promo from WIXX, click here. Triangle Distributing will be at the restaurant from 4-5:30pm sampling Leinenkugel's Grapefruit Shandy & BeerGarten Tart. Rhythm Kings from Milwaukee will be performing live covers of all your favorites from 5-9pm. Throughout the day, we'll be running food and drink specials, giving away summer-time prizes and hosting tailgate games.